Commonly referred to as slimline verticals or skinny verticals, BlindsmadeinUSA.com 2" Vertical Blinds are a great option for narrow windows or shallow mounting areas. 2" Verticals rotate 180 degrees, to block the sun's glare while still providing an outside view. Vanes traverse like drapes to the side for a full outside view. 2" Vertical blinds also help save energy by increasing insulation for windows, and by blocking or letting in sunlight to keep rooms cooler in summer and warmer in winter. Two Inch Verticals are great for narrow windows. 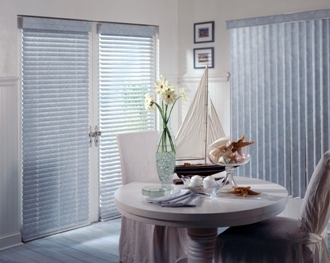 We also carry matching 2" Horizontal Blinds and 3 1/2" Verticals. How about putting a 2" horizontal blind in the same room as your 2" vertical. You can use the 2" horizontal on the smaller windows and the 2" vertical on the larger windows and patio doors.